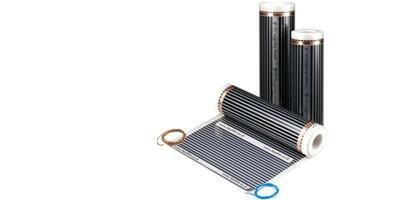 Underfloor Heating World 200watts/sqm Heat Film kits are designed for use under wood, laminate and carpet floors. Due to its ultra even heat distribution it is the only heating system capable of delivering 200watts/sqm, (primary heat source) directly under wood, laminate and carpet floors. 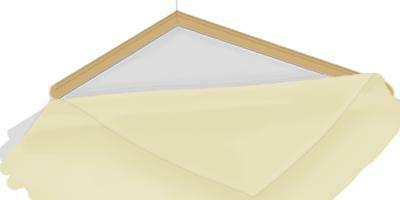 1.5m2 Ultra thin, only 1.5mm thick. Easy and quick to lay. Only 200watt/sqm system suitable for use directly under all wood, laminate and carpet floors. Mats can be tailor made to virtually any length. Full 15 year manufacturer's warranty. 0.5m, 0.8m and 1m widths. Virtually any mat length available, (made to measure). 2.5m long cold / connection tails. 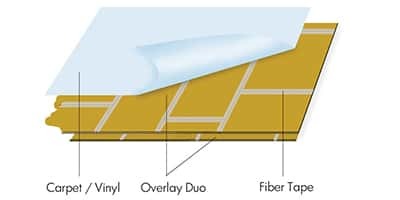 Your final floor build up should consist of the following layers in the graphic to your left, the insulation is a crucial part of the installation this is to insulate the heating and bury your connection tales into the insulation to maintain a level floor. 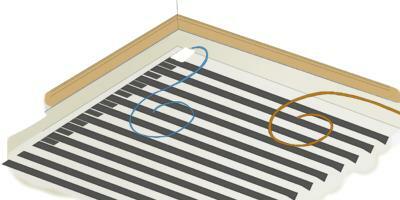 Unpack the heating system and check the under carpet heating system is the correct size and not damaged. Clean the sub floor ready for installation to begin making sure the floor is stable and level. Lay Impact plus insulation over the entire floor area that is to be carpeted. 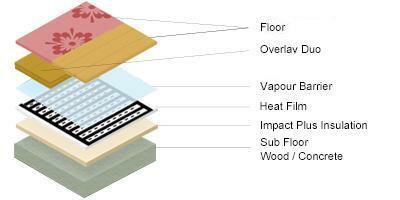 Lay your heating mats directly onto the Impact plus thermal insulation. Fix them in place with the tape provided. Once you have laid the heating mats score the insulation with a Stanley knife and embed the connection tails and floor probe leading back to your thermostat into the grooves. This is to maintain a level floor and avoid high points. 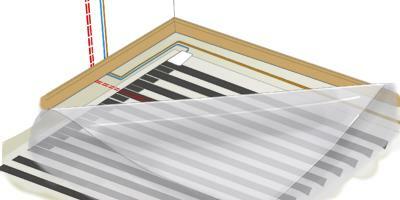 lay the vapour barrier directly over your heat mats. Install Duo Overlay over entire floor that is to be carpeted (wood or laminate floors will skip this step). 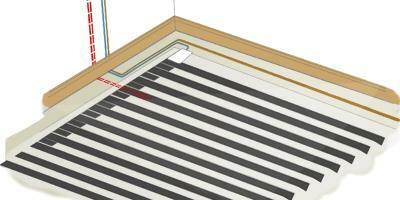 A suitable low tog carpet, (2 tog or lower) can then be installed over the floor. Underlay in not required as the impact plus also works as a direct replacement. If additional underlay is required a low tog underlay can be installed that has a tog rating of 0.8 tog or lower. The Heating should be tested before, during and after instillation to check it has not been damaged during instillation. Comprehensive fitting instructions are supplied with all our underfloor heating systems along with warranty registration form and information. All orders placed before 1pm will be packed and dispatched same day on a fully trackable delivery service. All standard UK delivery addresses are dispatched on a priority next working day delivery service. All remote locations are and off shore UK addresses are typically dispatched on a 48 hour working day service. All international (Non UK orders will be dispatched on an international priority service. Depending upon the country and your address within the country, delivery is normally between 2 – 5 working days. All standard UK deliverys are Free of charge but for some remote locations and all offshore addresses a delivery surcharge will be applied. We keep all delivery cost to a minimum, so please feel free to email of call us if you would like to confirm the delivery cost for your preferred address. All our delivery services are fully trackable and will be delivered by ourselves or a reputable currier such as FedEx. All orders are treated with urgency and we can provide estimated times for delivery if needed. We are not however unable to guarantee a specific delivery time or day as drivers get lost, vans break down, ports get blocked and air traffic controllers go on strike! White manual thermostat, perfect for customers who simply want to keep things simple. Fitted with a simple turn dial temperature control and on / off switch to regulate your underfloor heating system. Supplied with floor probe and fitting instructions. D600 digital thermostats are a great entry level thermostat for use with all our underfloor heating systems. The thermostat is fully programmable or can simply be use in manual mode. Supplied with both air and floor sensors, full instructions, this unit is also available in white, silver and black colours. The T700 white touch screen thermostat is a very competent touch screen, user friendly, fully programmable thermostat. Supplied with both air and floor sensors, full instructions this thermostat is easy to use with all underfloor heating systems. Once installed they will add a stylish modern touch to any room with the added sophistication of the touch screen capabilities. The CT1000 colour touch screen thermostats is the class leading electric underfloor heating thermostat. With a full colour 4.3 inch touch screen, variable power output, multi-functional programming options, this thermostat has a very intuitive layout making it super easy to use. It can be set to fully automate your heating or can be used in manual, party, comfort or economy modes. With both air and floor sensors the CT1000 will add a great addition to any room and is available in Glacier white, titanium silver and gloss black.